Yet another classic colorway is revisited by NIke SB, with this all new Supreme-inspired SB Dunk Mid set to release later this year. 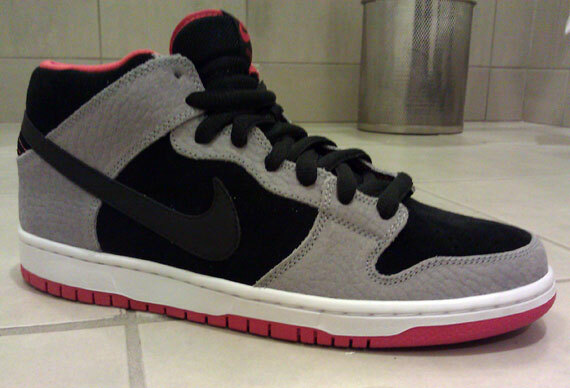 We all know the original black/cement Supreme x Nike SB Dunk Low is one of the most coveted shoes of the last 10 years. Giving us flashbacks of those Supreme classics, Nike SB is set to release this all new SB Dunk Mid Pro making use of a similar color scheme. Although elephant print is not present, the combination of black, grey and red is still on point. We see black suede taking place in the toebox and underlays, while a grey textured leather takes place along the toe, eyelets and heel panel. Additionally, we see red taking care of the outsole, sockliner and tongue branding. The 'Un-Supreme' SB Dunk Mid Pro is expected to hit select Nike SB retailers this October.